As school budgets continue to decrease and administrators need to find creative solutions for getting the supplies needed for an effective learning environment, you can count on Sandia Office Supply to provide the affordable solutions you need. We have a custom school supply catalog that features over 6,000 items. From furniture to art and classroom supplies, we have the selection you need to make the best choices for your school. You can request a catalog from one of our friendly service representatives. No matter what your needs, we are able to process your order quickly with next-day delivery. We don’t require a minimum order because we know that when it comes to teacher school supplies, you need what you need—when you need it. 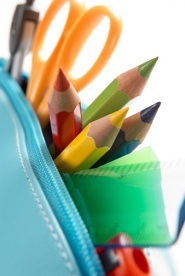 At Sandia Offices Supply, we work with you to find the most affordable solutions for your school supply needs. When you choose us, an experienced account representative will help you find ways to stretch your budget to effectively meet your needs. When you are looking for a reliable teacher school supply store to meet the needs of your institution, please contact us. We are committed to working with you to find the best solution to meet your needs at an affordable rate—and with exceptional service. Sandia Office Supply is your single-source solution for everything your school needs to run efficiently. Call 505-341-4900 to order your school supplies from Sandia Office Supply of New Mexico today!